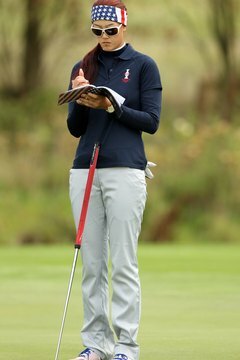 Michelle Wie makes a note in her yardage book during practice prior to the 2011 Solheim Cup. Yardage books compiled by players or their caddies offer details about a golf course that go far beyond the numbers you’ll find on a scorecard or a sprinkler head. Basic charts may assist a casual player, while the most advanced charts are designed to help professional golfers choose clubs and develop playing strategies on the course. For most of golf’s history, players trying to determine the distance of a particular shot had little more to work with than the basic tee-to-green measurement and their own judgment. Ben Hogan took the first steps -- literally -- toward making distance judgment more scientific by pacing off yardages in the mid-20th century, but he kept the figures in his head. Shortly thereafter, some players began writing notes regarding the distances of certain course landmarks from the hole. Caddies eventually took charge of surveying courses for their players, and some published guides offering a variety of details regarding courses across the country. A standard yardage chart includes an illustration of a hole on which numbers are written at various points. A line or arc is drawn across the fairway, along with a number indicating the yardage from that point to the middle of the green. The chart may include the name of the landmark that corresponds to the line or arc. For example, a chart may contain a caption toward the right of the fairway that reads: “197, first large oak.” This means the player is 197 yards from the middle of the green when he’s even with the first large oak to the right of the fairway. More advanced yardage charts will include all of a hole’s hazards, with tan-colored areas for bunkers and blue areas indicating water. A number written on the green indicates the green’s depth. Lines on the green show how a putt will break. The chart may mark the optimal fairway positions for tee shots on dogleg holes, and may also state the distance from the tees to those positions. For example, red numbers may indicate the yardage from the front tees and blue numbers the yardage from the back tees. The chart may also include a line drawn straight from the tee to the green, indicating the distance of a shot that cuts the dogleg. Charts made specifically for a professional may include information on how the golfer played the hole previously. For example, notes regarding a hole played by LPGA tour pro Angela Stafford, quoted in a “USA Today” article, read: “WED, 125 to F, 8, PH, LAW.” The “WED” stands for Wednesday -- in this case Wednesday of the tournament played the previous year. The “125 to F” represents the yardage to the front of the green. The “8” means she played an 8-iron. “PH, LAW” means she hit her shot pin high, a little against the wind.